The 55UX600 is one step below Toshiba's flagship SV670U series. But the LED edge-lit LCD UX600 series still has plenty to offer. 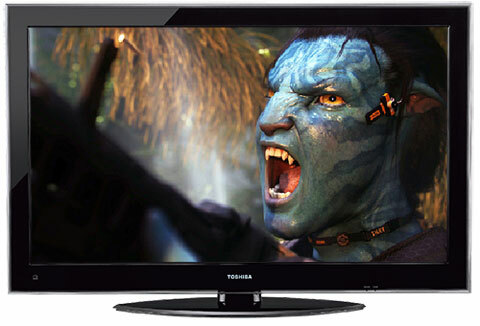 This 120Hz TV provides an Internet content package titled NET TV that includes Wi-Fi capability and a whole host of streaming content providers through Toshiba's relationship with VUDU. And if you ever wondered why you would want a 55" TV, viewing the polychromed Pandoran landscape (on the Avatar Blu-ray) will erase any of those doubts. The 55UX600 makes a great TV for events like playoff parties. With its 55" screen, family and friends can follow the ball (base, basket, golf, foot or fut) easily without crowding around the TV. But before you start searching for the glasses, this model does not play 3D content. Toshiba has not yet released a 3D ready TV. The more I watched the Toshiba 55UX600, the more I appreciated its bright colorful 55" image. But the screen did display a bit of light leakage that was noticeable in very dark scenes and the blacks could be deeper. Though Wi-Fi is not built-in, Toshiba does supply a wireless adapter. 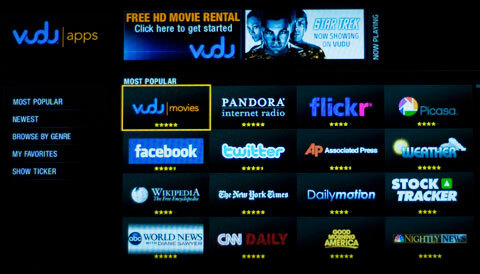 The VUDU apps of streaming content providers was extensive. The 55UX600 is DLNA Certified, which integrates it into your home network. Of course, if you are looking for a 3D ready TV, this is not it. Setting up the 55UX600 is quick and straightforward, even the networking procedure. Though once you are connected, leave yourself some extra time to explore all the Internet content partners. Toshiba lists the 55UX600 for $2399. Most of the reputable online retailers are selling it for $200 less, which is not much of a discount. Though 55" displays are becoming more common these days, the screen size is still at the top end and you should expect to pay at least a bit of a premium. For a 55" edge-lit LED LCD with all the Internet partners, the 55UX600 is competitively priced. Whenever I think about pulling a 55" TV out of its box, my back muscles begin to twinge. Therefore I was pleasantly surprised when I grabbed the 55UX600 (with the assistance of another able body) and lifted it up and out. Measuring only 2" deep, this TV weighs less than 63 pounds with its stand attached. Though in the box, the stand is not connected to the TV. You have to lay the screen flat to screw on the stand. I'm never keen about this process, but unless you have at least two others helping you, this is definitely the recommended method. Once affixed, the TV does not swivel on the stand, which makes the setup less flexible for adjusting to different seating arrangements. The two inch glossy black bezel is framed by a layered plexiglass with a subtle gray dot texture that Toshiba labels their Air Lagoon design. When the TV is turned off, you can see that the glass on the front of the screen employs some sort of glare filter, which reduces the effect of any direct reflections. When the TV is on, glare is really not a problem for me. The front of the TV is only adorned by the Toshiba logo and Power and Timer lights. The speaker grilles are hidden on the bottom of the frame pointing down. The USB1 port is where you can plug in USB devices to play JPEG photos, MPEG2 videos or MP3 songs. The USB2 port is where you attach the wireless LAN adapter that Toshiba supplies. Of course, if you decide to go wired, in between the two USB ports is the LAN input. In addition Toshiba provides an SD card slot, which is not common on many TVs that I have seen. It offers a convenience to those who have digital cameras that record on SD cards. On the back, a second panel includes two more HDMI inputs (one has a matching stereo minijack Audio In). The audio jack is shared by a VGA video input for PCs. For sending audio to external speakers or a receiver, an SPDIF (optical) digital Audio Out is provided. But if you are part of the growing surge of content consumers (mostly under 35 year old) who are cutting the cable and trying to rely on the Internet as their movie and TV source, then you will be more interested in the 55UX600's NET TV streaming capabilities. Rather than partner with a number of individual Internet content providers, Toshiba is working with one, VUDU, who seems to be acting as an aggregator of an impressive assortment of sources, 106 of them at last count. Some like Rachel Maddow's show on MSNBC are full length episodes. Others like Dexter only offer clips. For movies, VUDU has its own rent or purchase service. They offer you a free movie rental when you register. You might notice that YouTube is missing from the VUDU Apps list. But if you go into the Applications sub-menu, you'll find a button that links you to a separate, snazzy YouTube XL search interface. If you are a HULU or Netflix fan, you can still access them but through a less direct method. You can purchase MediaMall Technologies' PlayOn media server (a lifetime subscription is $39.95) and install it on your DNLA compatible computer. Then on the 55UX600, back in the Applications sub-menu, you hit Media Player and the TV will find the PlayOn server, from which you can stream HULU, Netflix and other content providers. I know that I sound like a broken record, but if you are serious about obtaining good streaming video picture quality, you will need fast and robust bandwidth from your Internet provider, ideally around 10Mbps. And if you are going wireless, I suggest that you opt for a 802.11n router to feed the dual band wireless adapter that Toshiba packs in the box. The Media Player can also access videos, photos and music stored on your computer or other compliant devices and play the content directly on to your HDTV. The slideshow interface is pretty basic, though it offers a good range of interval times (3, 5, 10, 15, 30, 60 and 90 seconds). There are no transition choices. Basically slides fade up and down from black. You also can't add music to the slideshow. But you can adjust Picture Controls while in the Media Player. When you look at the multi-function remote control with its white buttons, you might think that it is backlit. It is not. But after exposing it to a little indirect sunlight, the buttons will glow a light blue in the dark. Most of the buttons are big and the labels are easy to read. The layout is fairly standard. I did expect the Menu button to be around the navigation wheel. 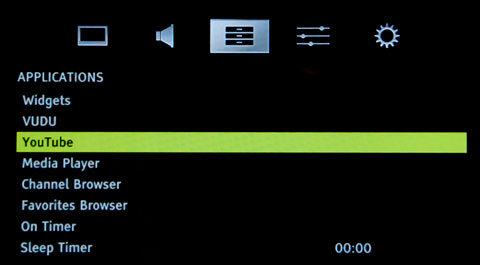 Instead, the designers added a Quick button that opens up an abbreviated menu where you can access features like the Picture Controls and the Media Player. 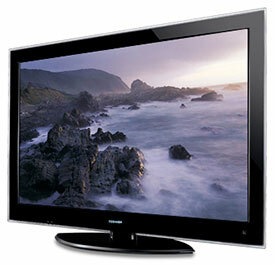 The EPA is now publishing a list of ENERGY STAR qualified TVs. (You can find it here.) The Toshiba 55UX600U is on the list. The EPA states that this Toshiba's On Mode Power is 116.45W and Standby Power Consumption is .09W. Based on the formula that the TV is on five hours a day and in Standby for the other 19, the Estimated Annual Energy Use is 213 kWh/year. You need to check your electric bill to see how much you are paying for a kWh. The rate that I have been using in previous reviews is 10.4 cents. Doing the multiplication, at that rate, the yearly energy cost is $22.15. Since manufacturers are not attaching those yellow ENERGY STAR tags that you find on air conditioners and refrigerators, you will have to study the ENERGY STAR list to see how the 55UX600U compares to other 55" TVs. From a quick perusal, this Toshiba is energy efficient. 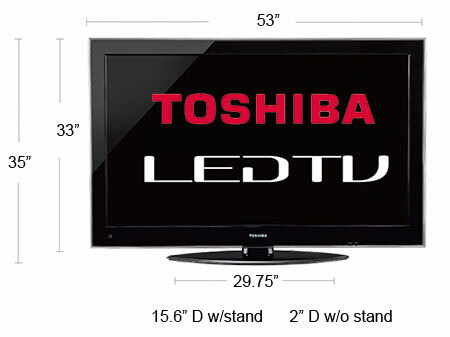 Even some other 55" models from Toshiba consume 50% more electricity. And remember when you compare TVs of different sizes that screens that are even a few inches larger are quite a bit bigger in total area. For example, the total area of a 55" TV is over 35% more than a 47". We use the test patterns to adjust black level, white level, and color bias. The player is set to output a 1080p signal, which is the native resolution of the 55UX600. 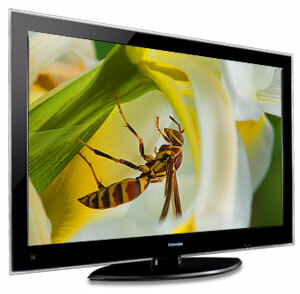 I reviewed a couple of other Toshiba TVs last year and this 2010 model has very similar picture and audio tools. Which is a good thing since Toshiba furnishes one of the most extensive set of adjustments that I have seen from any manufacturer. For example, they offer six default Picture modes: AutoView, Sports, Standard, Movie, Games, and PC. To my eye, Sports is similar to other TV's Vivid, which is just too, too. If you are setting up a home theater with this 55" display, then you definitely should test Movie, which is a bit more subdued then Standard but might just be right for a darkened room. I picked Standard as my jumping off point and went into the Advanced Picture Settings and turned everything like Dynamic Contrast to Off. Next, I set the Color Temperature, which is in the Advanced Settings Menu. Even with this adjustment, you can begin to see the amount of control that Toshiba is giving you. Usually, the choices are Cool, Normal and Warm. The 55UX600U offers a slider from 0 to 10. 0 being Warmest Warm and 10 being Coolest Blue. Standard mode defaults to 7. I pushed it to a neutral 5. As a reference, Movie mode defaults to 2. I then went back to the first page of the Picture Settings menu and turned down the Backlight to 50 from 60 (out of 100). Your number may vary depending on the lighting conditions in your room. According to the test patterns, I notched Brightness up to 2. I dropped Contrast (Picture) to 80. I lowered Color (Saturation) to around -8, and Tint (Hue) was nudged to 3. Even though the test patterns may indicate to turn Color down to around -8, when you switch back to a DVD, you might find that skin tones are too pale. I usually would suggest playing your favorite movie and tweaking Color until skin tones look natural to you. But if you just bought Avatar, adjusting to Na'vi skin tones might be a little tricky. If some of you are trying to set up your TV without one of the calibration DVDs available, then you might not have a blue filter to check color bars. Toshiba provides an alternative, which is also more reliable then those cheesy filters that can wash out over time. In the Advance Settings sub-menu, there's a feature called Expert Mode. In it, you can turn off the Red, Green or Blue components of the picture. You can achieve the blue filter effect by disabling Red and Green in this menu. The one disadvantage to this tool is that it flips back to full color when you exit this menu. The Sharpness scale runs from -50 (Min) to 50 (Max). When looking at a Safe Zone test pattern, I noticed the beginning of fringing at about -10 and it became more distracting around 0. Since I am not a big fan of over-sharpness, I hedged the setting even lower to -20. There is definitely some wiggle room for those who like a little more edginess in their TV. After a few minutes adjusting the basic picture settings, I ended up with a big bright colorful image. If the image doesn't seem to have enough depth in the shadows, you should go into the Advanced Settings menu and test Dynalight, Dynamic Contrast, and Static Gamma. For additional color tweaking, turn on ColorMaster, where you can set Hue, Saturation and Brightness for individual R, G, B, C, M, and Y colors. Before we leave the Picture menu, the 55UX600U is a 120Hz display. 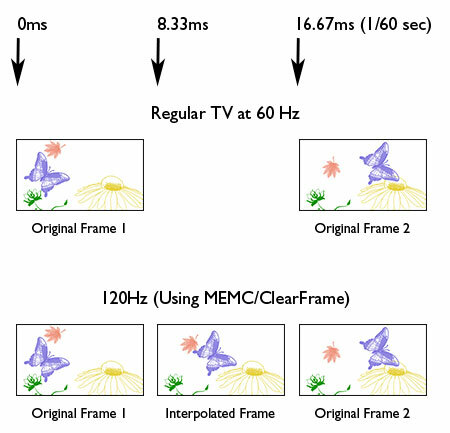 I have often discussed the MEMC (motion estimation, motion compensation) technology that interpolates 60 frame per second content (60Hz) and creates 120 frames (120Hz). On this TV, you activate this interpolation by turning On the ClearFrame feature in the Advanced Settings menu. ClearFrame helps clear up motion blur, which can be noticeable in fast action scenes. The Film Stabilization feature effects 24p content (normally movies on DVDs). When turned to Standard, the display simply repeats a frame five times to reach 120Hz. In Smooth, the MEMC interpolates four new frames in between the originals to create 120 unique frames. I left ClearFrame turned on and Film Stabilization set to Standard. Experiment with the different combinations to see which you prefer. Finally, I'm no more knowledgeable about the Backlight Adjustment Pro tool then when I first ran across it with the Toshiba 46SV670U. I simply let that sleeping dog lie. Now, if you plan on sampling the Internet content then you will need to connect to your home network, either wired or with the supplied wireless adapter. I prefer wired. All I did was attach an Ethernet cable from my router to the TV's LAN port. Without doing any setup, as soon as I turned the TV on, I received a message on my PC Windows screen that a device was found. I set the permissions and the 55UX600 could see files on my hard drive. As a test, I also pulled out the Ethernet cable from the TV and attached the wireless adapter. The Wi-Fi network setup process on the TV was painless and the streaming video quality was just fine. The first time I turned on the 55UX600 - before I even went through the initial setup - I noticed a little light leaking around the corners of the black screen. I can only see it when the screen is very dark and the visual effect is negligible. But it was my first impression and it took me some time before I could shake it. After running the TV through its paces, I began to feel more comfortable about how it performed when actually playing back content. 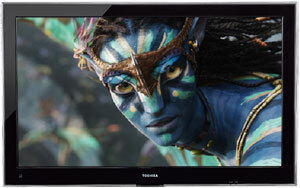 And then watching the Avatar Blu-ray solidified my appreciation of what this Toshiba could do. The shots of Neytiri and Jake swooping down and around the Hallelujah Mountains on their Ikran were breathtaking. I wanted to scream like a Banshee. With that said, this edge-lit LED cannot produce the consistent deep blacks like a plasma or a direct-lit LED with local dimming can. You might want to punch up Dynamic Contrast like the Movie default does, but don't expect that luscious, velvety black for which videophiles lust. The integrated pair of 10W speakers does a reasonable job for everyday TV watching. But with a 55" TV, how could you even consider not recruiting a separate dedicated 5.1 or 7.1 channel audio system? Even though the 120Hz LED edge-lit Toshiba 55UX600 doesn't produce the deep blacks of its direct-lit local dimming cousins, it still delivers a big, bright 55" image that is made for events like Avatar or the World Cup. And its NET TV feature provides Wi-Fi capability and a wide range of Internet content partners. Got this from Amazon for $1199 3 weeks ago and I love it! Naturally, going from a 540p 42" plasma was a jump, but I LOVE this thing! Only 2 problems so far, one of which is minor. Minor problem is if you use the wireless adapter, don't mount your in wall speakers right next to the TV. I'll change to a wired ethernet connection, but lets just say you will lose signal if you crank up the stereo using the internet connection. 2nd problem, but correctable is this needs netflix! Not a lot of selection on VUDU. correction...out the door price was $1189....not 1899.
for the low out the dooe price of $1899 , I'm reasonably pleased. viewing angles and screen glare are not good. Also in some situations I see flashlighting issue. Thanks for the great review. You covered all the points I needed to know. Excellent review. Reviews on this LED which is a pathbreaking one from Toshiba really, are far and fewer in between....I think experts are totally biased in favor of the Samsungs and Sonys....which give you much lesser bang for the buck! Thanks for the very thorough review! I bought the 40-inch version of one of these for $900 bucks a few days ago and have been struggling to find a decent, hands-on review ever since. I'm glad to hear the TV lives up to just about what I would expect: more than reasonable picture quality for an edge-lit TV, lots of connectivity options and a reprieve for your back.